What are risk factors for mucormycosis? What are mucormycosis symptoms and signs? What is the treatment of mucormycosis? What are complications of mucormycosis? What is the prognosis of mucormycosis? Is it possible to prevent mucormycosis? What research is being done on mucormycosis? Where can people find more information on mucormycosis? Mary D. Nettleman, MD, MS, MACP is the Chair of the Department of Medicine at Michigan State University. She is a graduate of Vanderbilt Medical School, and completed her residency in Internal Medicine and a fellowship in Infectious Diseases at Indiana University. Mucormycosis (zygomycosis) is a serious, potentially deadly fungal infection that's infrequently diagnosed. Many different fungi may cause mucormycosis; infections with the Mucoraceae family of fungi predominate as causes; hence, many investigators use the term mucormycosis instead of zygomycosis. Risk factors include poorly controlled debilitating diseases (including diabetes), immunosuppression and trauma (usually serious injuries), and groups of such patients injured in natural disasters. Symptoms and signs first appear usually in the body area infected and may occur as follows: fever, headache, reddish and swollen skin over nose and sinuses, dark scabbing in nose by eye(s), visual problems, eye(s) swelling, facial pain, coughing sometimes with bloody or dark fluid production, shortness of breath, diffuse abdominal pain, bloody and sometimes dark vomitus, abdominal distension, flank pain, an ulcer with a dark center and sharply defined edges, and mental-status changes may occur. Preliminary diagnosis is made by patient history, physical exam, and the patient's risk factors for mucormycosis; definitive diagnosis is made by identification of fungi in the patient's tissue. Almost all patients require surgical debridement of infected tissue, antifungal drugs (mainly amphotericin B), and good control (treatment) of underlying medical problems such as diabetes. Complications of mucormycosis can be dire: blindness, organ dysfunction, loss of body tissue due to infection and debridement, and death. The prognosis (outcomes) of mucormycosis infections range from fair to poor; there is about a 50% death rate that rises to about 85% for rhinocerebral and GI infections. Prevention of mucormycosis centers on avoidance or control of risk factors (see above), but not all infections are likely to be prevented; there is no vaccine for mucormycosis. Research shows mucormycosis infection incidences are increasing, especially with immunosuppressed individuals. More research may occur as the number of infections increase. The definition of fever is an elevation in body temperature or a high body temperature. Technically, any body temperature above the normal oral measurement of 98.6 Fahrenheit (37 Celsius) or the normal rectal temperature of 99 F (37.2 C) is considered elevated. However, these are averages, and one's normal body temperature may actually be 1 F (0.6 C) or more above or below the average of 98.6 F. Body temperature can also vary up to 1 F (0.6 C) throughout the day. Fever is not considered medically significant until body temperature is above 100.4 F (38 C), which is the temperature considered to be a fever by medical professionals. Anything above normal but below 100.4 F (38 C) is considered a low-grade fever. Fever serves as one of the body's natural defenses against bacteria and viruses that cannot live at a higher temperatures. For that reason, low-grade fevers should normally go untreated, unless accompanied by troubling symptoms or signs. Mucormycosis is the general term that indicates any fungal infection caused by various genera of the class Zygomycetes. Another term used in medical and lay publications that means the same is phycomycosis. Mucormycosis can result in an acute, rapidly advancing, and occasionally fatal disease caused by different fungi commonly found in the soil or environment. These fungal infections are diagnosed relatively infrequently; however, they occur in individual people who are debilitated in some major way (uncontrolled diabetics, immunocompromised patients) and occasionally in groups of people that are injured (often multiple injuries and penetrating injuries that are contaminated with soil and water from the environment). Such groups of people are those that are injured in disasters such as tsunamis, hurricanes, earthquakes or tornadoes, where otherwise healthy people can have contaminated soil and water inhaled, embedded in wounds, or simply forced into skin, mouth, eyes, and nose by the force of water, soil, or wind pressure. The disease is not passed person to person. A cluster of mucormycosis infections occurred in people who initially survived devastating tornadoes which struck Joplin, Missouri, on May 23, 2011. Thirteen cases were confirmed, all in persons with severe wounds, including fractures, multiple wounds, penetrating injuries, and blunt trauma. Ten patients required intensive care and five died. Because the majority of mucormycosis infections are caused by one family member in the class of Zygomycetes (family member Mucoraceae), many clinicians now term the disease mucormycosis instead of zygomycosis, the more "general" term. 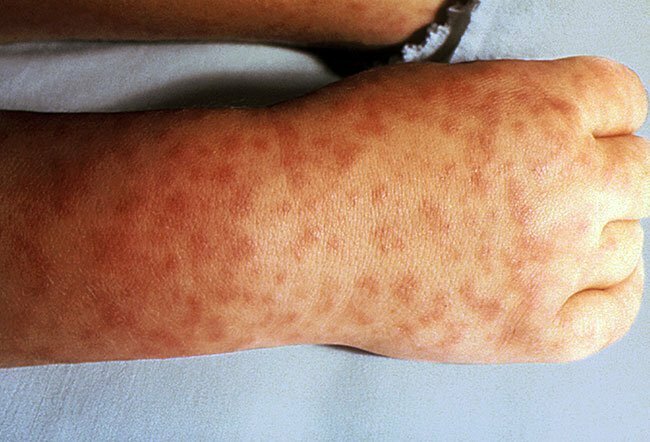 The lay press has used terms like "Black Death" and "Zombie disease" to describe this fungal infection but such terms seldom help people to understand this disease. Such terms may cause misunderstandings between the patients, their families, and the public; many clinicians think these potentially harmful or cruel terms should not be used by responsible individuals. Zygomycetes represent the general class of fungi that cause mucormycosis. Rhizopus arrhizus species from the Mucoraceae family are the most commonly identified cause of mucormycosis in humans. Other fungal causes may include Mucor species, Cunninghamella bertholletiae, Apophysomyces elegans, Absidia species, Saksenaea species, Rhizomucor pusillus, Entomophthora species, Conidiobolus species, and Basidiobolus species. Mucoraceae are found worldwide and in the ecosystem are responsible for initiating and decaying most organic material in the environment. 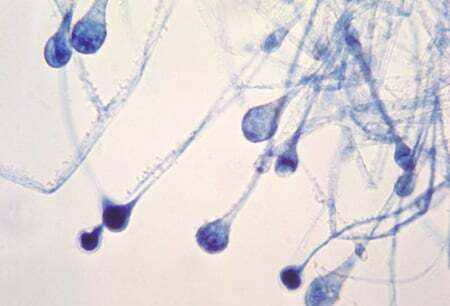 Most fungi are identified by their unique morphological appearance (see Figure 1) viewed microscopically and determined by a professional practiced in fungal identification (microbiologist or pathologist). In general, mucormycosis is an infection not often seen by many doctors because the fungal causes are not readily infectious. Usually an infection develops because of some unusual circumstance that places the fungi in contact with compromised or injured animal or human tissue. However, once established, the fungi can rapidly multiply in blood vessel walls where it effectively reduces and cuts off blood to tissues, thereby creating its own decaying organic food source resulting in widespread tissue destruction. If this fulminant spread of fungi is not stopped, death is the outcome. A risk factor is any debilitating disease process, especially diseases that can yield compromised blood flow to tissue. The classic example is the patient with uncontrolled diabetes and foot ulcers where dirt or debris can easily reach compromised tissue. Patients with burns, malignancies, immunocompromised patients, patients with a splenectomy, and people with wounds (usually severe) that have been contaminated with soil or environmental water are at higher risk to get mucormycosis. Consequently, people injured in environmental disasters are, as a group, at high risk for this infection. Although these symptoms suggest that a patient may have mucormycosis, they are not definitive. In addition, they may not develop very quickly because it may take a few days to over a week in many people before the symptoms develop. When they do initially develop, it is not unusual to ascribe the symptoms to causes other than fungi (often to secondary bacterial infections). Consequently, the fungal diagnosis may be delayed (see diagnosis section below). Presumptive diagnosis is based on the patient's history, physical exam, and the patient's risk factors for getting a fungal infection. A definitive diagnosis is difficult. Although tests such as CT or MRI may help define the extent of infections or tissue destruction, their findings are not specific for mucormycosis. There are no serological or blood tests that are helpful. Growth of the fungi from a biopsy (tissue obtained by surgical removal or endoscopes with biopsy tool) of infected tissue, accompanied by special tissue stains looking for unique structural components, may identify the fungus and help make the definitive diagnosis. This helps distinguish mucormycosis from other fungal diseases such as candidiasis and histoplasmosis. However, it is still sometimes difficult to determine the specific fungal genus and species infecting the patient. Consequently, mucormycosis is often a "working" diagnosis that clinicians use because the supportive care and treatments for the causative fungal agents are essentially the same. 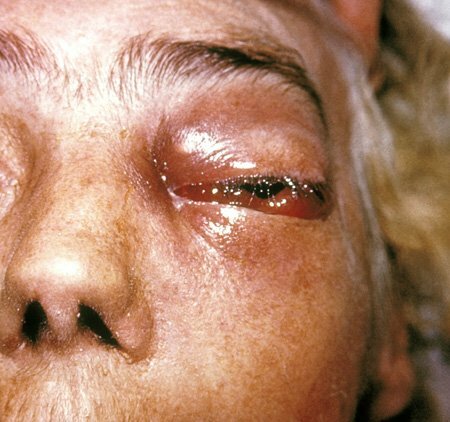 Figure 2 shows a periorbital eye infection eventually diagnosed as mucormycosis. Treatments of mucormycosis need to be fast and aggressive. The need for speed is because by the time even the presumptive diagnosis is made, often the patient has suffered significant tissue damage that cannot be reversed. Most patients will require both surgical and medical treatments. Most infectious-disease experts say that without aggressive surgical debridement of the infected area, the patient is likely to die. Medications play an important role. Two main goals are sought at the same time: antifungal medications to slow or halt fungal spread and medications to treat any debilitating underlying diseases. Amphotericin B (initially intravenous) is the usual drug of choice for antifungal treatment. In addition, posaconazole or isavuconazole may treat mucormycosis. Patients with underlying diseases like diabetes need their diabetes optimally controlled. Patients normally on steroids or undergoing treatment with deferoxamine (Desferal; used to remove excess iron in the body) are likely to have these medications stopped because they can increase the survival of fungi in the body. Patients may need additional surgeries and usually need antifungal therapy for an extended time period (weeks to months) depending on the severity of the disease. Consultation with an infectious-disease expert is advised. The complications of mucormycosis are serious and are related to the body area initially infected but also can occur in other body regions because the fungi often spread to the organs or tissues that physically contact or are near the originally infected area. In addition, because surgical debridement is almost uniformly needed, some normal tissue may be destroyed because the surgeon must remove all tissue that is dead or dying. Unfortunately, that means the surgeon may have to remove some normal tissue to insure all of the fungi are removed. An example is infection of the eye orbit; often the whole eye must be removed. Consequently, serious complications such as blindness, meningitis, brain abscesses, osteomyelitis, pulmonary hemorrhages, gastrointestinal hemorrhages, cavitary lesions in organs and eventually secondary bacterial infections, sepsis, and death may occur. The prognosis of mucormycosis is usually fair to poor; the prognosis depends on the overall health of the patient, the speed of diagnosis and treatment, the patient's ability to respond to treatments, the complete debridement of the infected body area, and the body area that is initially infected. For example, the mortality (death rate) of patients with rhinocerebral and GI mucormycosis is about 85% while the mortality rate for all patients with other types of mucormycosis is about 50%. Patients who survive this dangerous infection often have disabilities related to the extent of tissue lost due to the fungal destruction and the necessary surgical debridement (blindness, limb loss, organ dysfunctions). Avoiding predicted disasters (hurricanes) and taking safety measures if possible (getting to safe shelters if warning of a tsunami, tornado, or earthquake) are probably the best ways to avoid mucormycosis. Patients with debilitating disease can increase their likelihood of avoiding the infection by good control (treatment) of their health problem with diabetes as the classic example. Some clinicians suggest that if a patient is exposed to circumstances that are favorable for mucormycosis to develop, if they are taking prednisone (Deltasone, Orasone, Prednicen-M, Liquid Pred) or deferoxamine (Desferal), they should cease these medications (consult your doctor or emergency center if possible before modifiying medications). Finally, if a person thinks they may have mucormycosis, they should consult their doctor or an emergency center immediately. There is no vaccine available for mucormycosis. In some instances, there is no good way prevent mucormycosis (severe accidents, lack of disaster warnings, no shelters available). Unfortunately, very little research is being done on this disease. Most studies available discuss the two major factors. First is the data showing the increasing incidence noted in patients with debilitating diseases, currently with a focus on those who are immunocompromised by diseases or by medical treatment. Second are studies comparing treatment plans of surgery combined with antifungal medication. Currently, surgery and amphotericin B still seem to be the treatments that give the best results. As the incidence and recognition of zygomycosis (mucormycosis) increases, more research may be done. 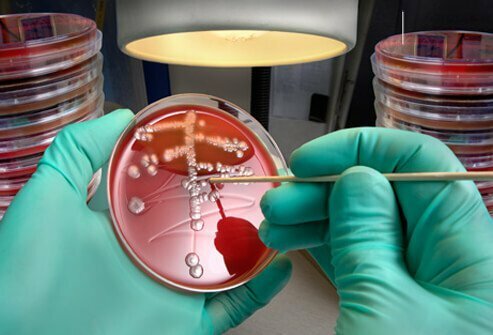 Readers who are not familiar with fungal infections are advised to read any short summary or overviews about the classification, growth, and diseases caused by fungi. McDonald, P. "Mucormycosis (Zygomycosis)." July 11, 2017. <https://emedicine.medscape.com/article/222551-overview>. Sun, Y., and N. Singh. "Mucormycosis: Its Contemporary Face and Management." Lancet Infect. Dis. 11.4 (2011): 301-311. If known, what were the risk factors for mucormycosis in you or someone you know? Describe the signs and symptoms you experienced with mucormycosis. Describe the treatment and medications received for mucormycosis. Blindness is the state of being sightless. Causes of blindness include macular degeneration, stroke, cataract, glaucoma, infection and trauma. Symptoms and signs may include eye pain, eye discharge, or the cornea or pupil turning white. Treatment of blindness depends upon the cause of the blindness. Protect yourself from different fungal infections like ringworm, athlete's foot, and jock itch. Discover how to treat fungal infections on the foot, hand, skin and everywhere on your body.